The basic flute is the preferred flute of Native flutists that travel and perform since it packs nice and easy. The basic flute does not contain any intricate carvings either in the "bird" or throughout the body of the flute so the fear of damaging the carvings while you travel is minimal. The basic flute varies in price from $125 to $325 depending upon the type of wood that is requested. Generally, the harder and more exotic the wood the more the price will change. If you do not see your preferred wood choice please contact us for availability and pricing. For examples of wood choices please visit Wood Workers Source and choose from either Domestic Lumber or Exotic Lumber. 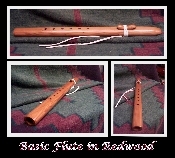 The basic flute may also be upgraded by purchasing a carved "bird" at a later time.